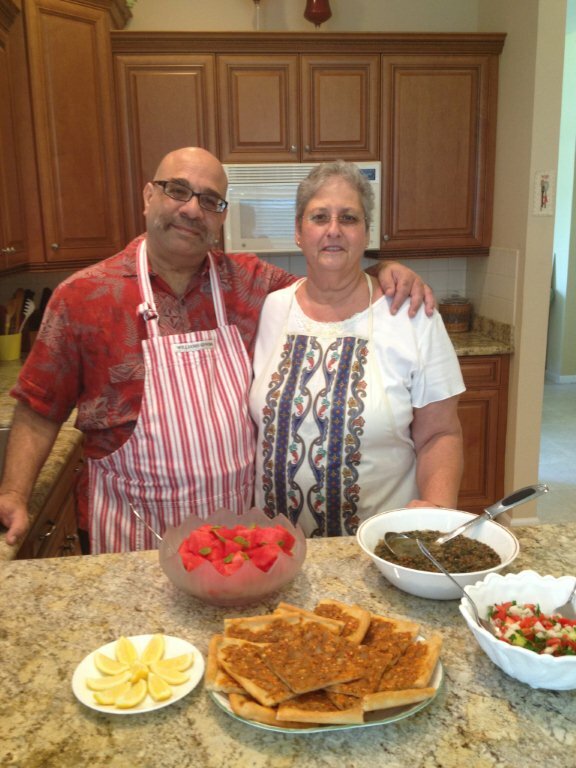 BOYNTON BEACH, FL — What’s cooking in the Armenian Kitchen these days? Chief cooks Doug and Robyn Kalajian happen to be celebrating an auspicious occasion with another delectable meal and perhaps a bottle of champagne. They’re toasting a happy marriage as well as a happy website that has caught the attention of its one-millionth page viewer. You’re all invited to dinner with Robyn and Doug Kalajian inside their Armenian Kitchen online. The big day arrived May 27 when the website registered 547 hits, a tad less than the previous day, which received 931. Over May, the site registered 27,580 views, and passed the million mark by 331. It has anything and everything you wanted to know about Armenian food a million times over and still counting. Among the latest queries was from Mark Gavoor with his oud in hand. He represents the voice of Chicago with an appetite to match, especially when it comes to such delectables as perper salata, Kharpert kufteh and topig. Just like medzmama’s cooking! Whether it’s their concoctions, a friend’s, or from another’s cookbook, it’s all up there for people to enjoy, says Gavoor. “The Kalajians provide great stories and give ample credit to wherever the recipes may originate from,” he adds. Put on an apron, wash your hands, and join the Kalajians on their epicurean journey. We caught up with the Kalajians in the comfort of their kitchen. No doubt, it’s their favorite room. And with the electronic era, they share it with the world. Doug, too, is absolutely dumbstruck by the overall popularity of his nutmeg. As he understands it, the stats mean his website has been clicked on over a million times by almost 300,000 different readers. Other remote areas include Mongolia, Laos, Iceland, Uzbekistan, and United Arab Emirates. A man from Australia was so desperate for the taste of basterma, he sought the recipe. A woman from Canada sent along an easy method of making madzoon in a microwave. Others are hoping to find lost family recipes. Along the way, he wrote a non-fiction book called Snow Blind about a crusading public defender caught up in Florida’s cocaine insanity of the 1980’s. Robyn, a retired culinary arts teacher, remains the chief cook with this production duet; her husband calls himself a sous chef. Dining with them in an elaborate Florida restaurant is quite the appetizer. “I’m absolutely dumbstruck by the overall popularity of YouTube, which has displaced traditional TV for so many people,” Doug points out. Most popular so far is how to make shish kebab with more than 65,000 views. More so than the website, the videos seem to draw a diverse audience that includes many non-Armenians. The reaction has been powerful and sometimes overwhelming. “Our cooking videos have been watched more than 230,000 times by viewers from around the world.” Doug notes that some videos have also become a lightning rod. The Kalajians remain content to leave questions about the food industry to the experts while they try to satisfy a clear desire among Armenians to share their recipes and the traditions they represent. One lesson that’s been driven home is that the Armenian menu is incredibly varied because it reflects the far-reaching experiences and travels of the Armenian people over centuries. After starting the website in March 2009 with nothing more than the thought of sharing recipes with an unknown global audience, it’s become an evolving turnstile. The Kalajians are based in Boynton Beach, where they cook and write. Both are involved with St. David’s Armenian Church and piped into the Armenian community. They’ve connected people with recipes, specific ingredients, and other curiosity-seekers. Through their website, they found a cousin named Maro Nalabandian, a noted pastry chef. Baking the distinctive cheese bread recipe that Robyn learned from her grandmother not only brings back memories, it gives the Kalajians a small taste of the little village in the shadow of Musa Dagh, which her ancestors left nearly a century ago. A plea for assistance came from Tigran Shahverdyan, a scientist from Moscow participating in the International Space University’s studies program at Florida Institute of Technology. He didn’t have a car and needed to know where the nearest Middle Eastern store was located. He wished to buy lavash for a cultural project to which he was committed. Being the only Armenian in the group, he wanted to do an Armenian-style barbeque. Using her computer, Robyn located a store near his school that sold lavash and passed on the information diligently, much to the delight of the faculty and students. The Kalajians would love to publish their own cookbook but the idea always seems to find “the back burner.” Yet, it’s not out of the question. A calendar has been suggested and that’s another possibility. It’s just a matter of time and timing. As for television, that’s highly unlikely. They’ll stick to their YouTube videos for now. In the meantime, they’ll focus on being an interactive site that reaches far beyond their wildest dreams. This article has appeared in various Armenian-American publications and is reprinted with the permission of the author. Posted on June 22, 2013, in Arts & Culture, Food, News and tagged Armenian, Kalajian. Bookmark the permalink. Leave a comment.